BRACAnalysis ® is a genetic test that detects the presence of a BRCA1 or BRCA2 gene mutation. BRCA mutations are responsible for the majority of hereditary breast and ovarian cancers. People with a mutation in either the BRCA1 or BRCA2 gene have risks of up to 87 percent for developing breast cancer and 39-63 percent for developing ovarian cancer by age 70. Mutation carriers previously diagnosed with cancer also have a significantly increased risk of developing a second primary cancer. In fact, patients with these types of mutations have an up to 64 percent chance of developing a second breast cancer by age 70. BRACAnalysis requires only a simple blood test or oral rinse sample to determine if a person has a BRCA1 or BRCA2 mutation. Knowing the results may help patients and their healthcare professionals either prevent or delay the onset of cancer or detect it at an earlier, more treatable stage. 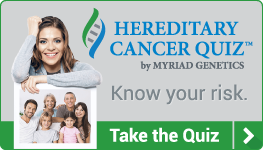 Myriad has developed a Hereditary Cancer Quiz that patients and can use to help identify potential candidates for genetic testing using BRACAnalysis. Avoid unnecessary interventions for family members who do not test positive for the mutation known to be in the family. Prophylactic surgery for mutation carriers. For more healthcare professional information, please visit MyriadPro.com.